Origin and Habitat: Stenocactus phyllacanthus is endemic to Mexico, occurring in the states of Aguascalientes, Guanajuato, Hidalgo, Jalisco, Nuevo León, Querétaro, San Luis Potosí, Zacatecas. Altitude range: It grows at elevations of 1700-2800 metres above sea level. Habitat and ecology: This species occurs in desert scrub where it grows and hides in high grass, and the spines that looks like dried grass leaves, make the plants almost invisible in their natural environment. Description: Stenocactus phyllacanthus, best known as Echinofossulocactus phyllacanthus, is a round cactus with the upper central spines three-pronged long, flattened grass-like and numerous wavy ribs, it is distinguished from similar wavy ribbed species by its small yellowish flowers and few radial spines. Older plants sometimes get corky near the base. There is a general lack of understanding on the taxonomic position of this species within the genus and thus is it no possible to define either the spatial or systematic limits of the taxon. There is much variation within the current taxon, and most of the "phyllacanthus" - especially those with pink o violet striped flowers - may correspond to other species. Stems: Usually solitary, occasionally few branched, depressed globose to short cylindrical, dull green or dark bluish green, flat or somewhat depressed apically, 3 to 15 cm. high, 4-10 cm in diameter. Ribs: (25-)30 to 35(-60), very thin, strongly undulate. Areoles: Only a few to a rib (mostly 1-2), white-tomentose when young. Spines: Shorter and less dense than in other species the main one broad and flattened. Flowers: Born singly or 2-3 together, produced sporadically all-through spring and summer, yellowish white with brownish red throats, 15 to 20 mm long. Tube short. Inner perianth-segments acute. 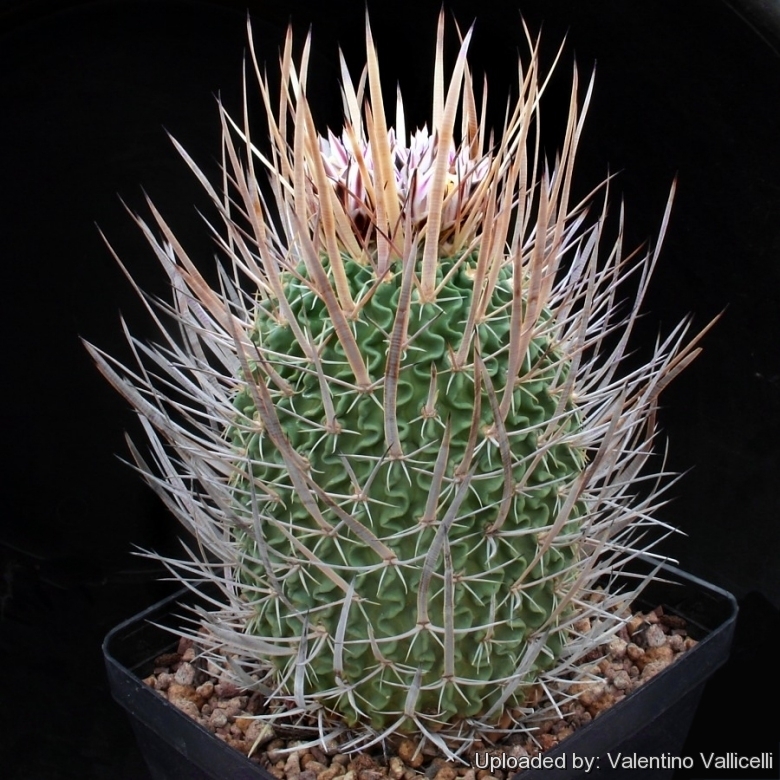 Remarks: Stenocactus tricuspidatus (a multiheaded species) has been moved into Stenocactus phyllacanthus in the most recent revisions. 1) Gómez-Hinostrosa, C., Sánchez , E., Guadalupe Martínez, J. & Bárcenas Luna, R. 2013. Stenocactus phyllacanthus. The IUCN Red List of Threatened Species. Version 2015.1. <www.iucnredlist.org>. Downloaded on 02 June 2015. 4) David Hunt, Nigel Taylor “The New Cactus Lexicon” DH Books, 2006 ISBN 0953813444, 9780953813445.